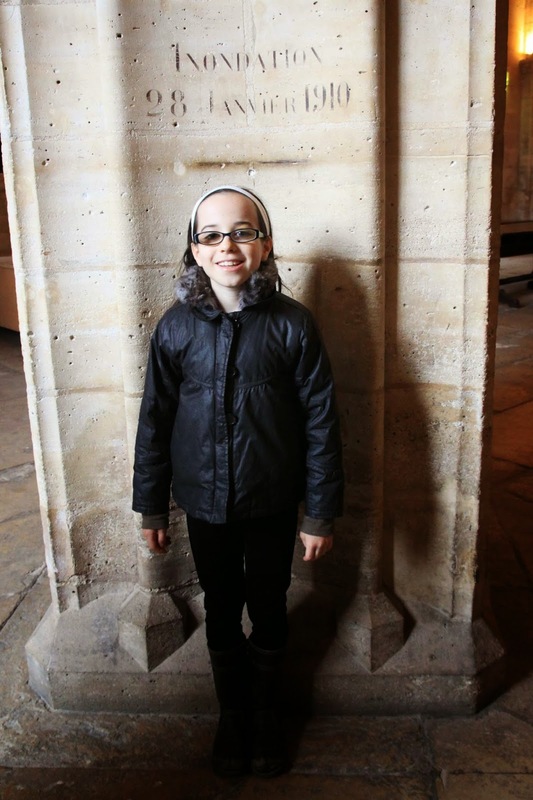 As a six-year old new to this "island living" thing on Ile St. Louis, Pippa looked around the swollen Seine in all directions outside our "shores" during the heavy rains and asked if we would float away. This, of course, seems a little preposterous, but it has looked a bit like that the past couple weeks. You can see there's no walking along the Seine. There is driving -- but only just in the last day or two. 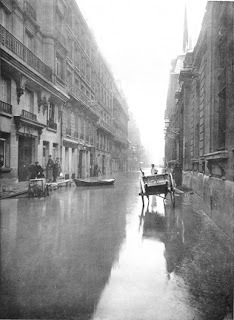 For weeks, there have been no cars on the roads along the Seine. How could there be? They would have had to run over the ducks and swans that were swimming all the way up to the base of the building in this picture. I must admit that it seemed like the waters would never recede, so I postponed getting the photo a bit too long, but take my word for it. Pippa's fear (which, I should tell you, she is well past, despite bigger rains and floods in following years) is not so totally unfounded. I mean, the islands aren't in danger of floating away, but they have been flooded in modern history. Once. 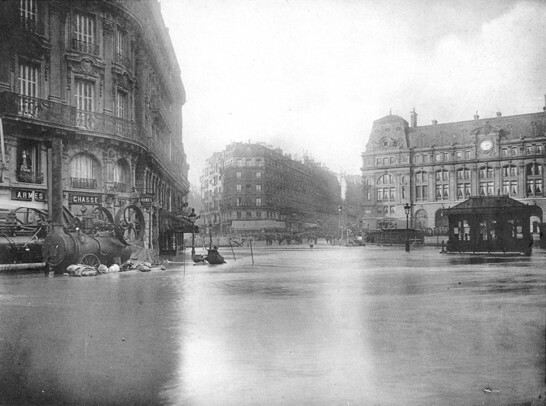 In the 1910 Great Flood of Paris, which supposedly can't be repeated due to better dams and water control systems: Over a hundred years ago, the water did not actually overflow from the river, though the pictures nearly look like it, but rather came up through the sewers and subway tunnels and drains. Streets were covered, with the water about 20 feet above normal level, and people got around by little canoes. One can imagine how fabulous the city smelled. 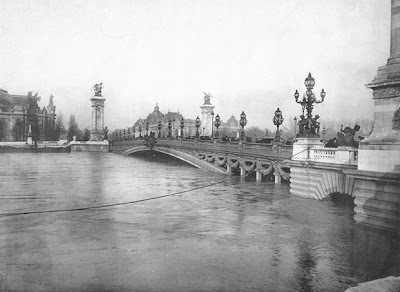 Paris measures floods by the "Zouave", a statue on one of the bridges (Pont de l'Alma) which was, in fact, underwater in the 1910 flood. 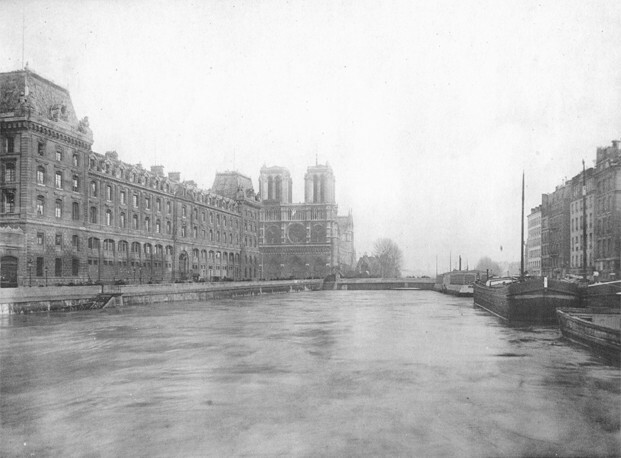 The Zouave has remained happy and dry last year and this year -- despite this being the highest level for the Seine that anybody can remember. I'm glad these historical photos of the 1910 flood exist, but I'm also glad I'm not able to re-create them. Instead of the Zouave, I measure it by the Gigi. Below, an indication of the scope, where Gigi stands inside the Conciergerie on Ile de la Cité -- just under the January 28, 1910 flood line. 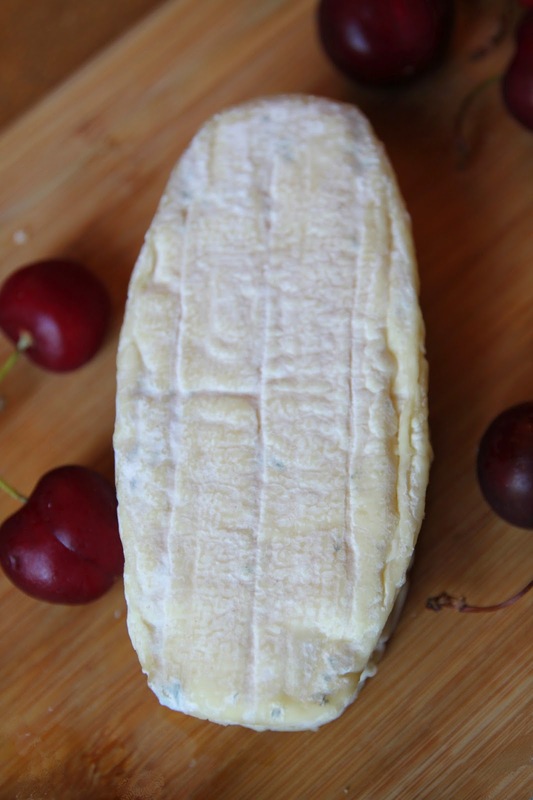 The Galoche au Thym is a specialty cheese, made in small batches by one farmer, and sold exclusively through the Laurent Dubois store, so you won't find it elsewhere. It's a raw milk goat's cheese combined with dried thyme leaves, hence the name "Galoche au Thym" which translates as "thyme clogs". Where do you think we got the word "galoshes"? It's that sort of sliceable, thick, almost peanut-butter textured dry-creamy. But then infused with thyme. And I don't mean subtly infused because the goats ate thyme, or anything like that. I mean fresh thyme mixed in; you can see hints of the thyme leaves lurking as dark spots under the fine crust. This cheese is so herby, in fact, that two families worth of children unanimously pronounce it too strong, whereas all the adults love it. This is a cheese I feel like I could melt down, and it would immediately be a perfect mac-and-cheese coating. When it rains, it pours. We may not have to worry as much about flooding nowadays, but it's still definitely time for galoshes.